Bicycle accident injuries can happen in an instant. Each year in California and in the rest of the country, thousands of bicyclists are seriously injured and hundreds are killed in accidents involving motor vehicles. According to the National Highway Traffic Safety Administration, or NHTSA, 48,000 bicyclists were injured and 748 were killed in traffic collisions in 2013 alone. The number of those injured or killed both were equivalent to 2 percent of traffic injuries and fatalities overall. Between 2010 and 2013, there was an increase of 19 percent in the number of bicycle accident fatalities. In California in 2013, 3,000 traffic deaths happened in accidents across the state. Of those, 141 fatalities were bicyclists, representing 4.7 percent of the total. The data provided by the NHTSA does not include bicycle accidents not involving motor vehicles or those occurring in driveways or other private properties. The statistics on bicycle accidents clearly shows that these types of collisions are potentially very serious, meaning that both bicyclists and other motorists need to be cautious in order to avoid accident involvement. There are several reasons why bicycle accidents can be very severe, including the physical forces that are involved when a cyclist is either struck by or strikes a motor vehicle. When a cyclist is struck by a motor vehicle, or when a cyclist strikes a vehicle, there are physical and biological forces at work that explain why these accidents tend to be so severe. According to physics professor Mats Selen of the University of Illinois at Urbana-Champaign, how fast a cyclist is traveling, how much he or she weighs and how suddenly he or she stops all factor into the severity of the resulting injuries in an accident. When a person collides with a hard object, such as a motor vehicle or the pavement, his or her injuries will be more serious if he or she comes to a very fast stop. People’s brains are surrounded by cerebrospinal fluid, which does provide some cushioning. Sudden stops can still cause the brain to hit the skull, resulting in brain injuries. Helmets provide some additional cushioning, helping to absorb some of the physical forces involved when a person’s head strikes a hard object after moving at a fast pace. Bicycle accidents also often involve friction, which results when the cyclist has a sliding injury. The faster the person was traveling, the longer he or she will slide on the pavement, producing greater friction and greater resulting injuries. Even when a bicycle suddenly stops because of a crash, the rider will still be moving. This can cause him or her to fly over the handlebars or off the side of the bicycle. In an accident, the average cyclist will hit his or her head at a speed of between 9.5 to 13.4 miles per hour, according to the Consumer Product Safety Commission. Helmets can help by dissipating the force of the impact over a greater area and potentially preventing skull fractures. The type of injuries a cyclist might suffer will depend on the type of collision, the speed of both the cyclist and the motorist, whether or not the cyclist was wearing a helmet and the road’s condition. Traumatic brain injuries are very common in bicycle traffic accidents, especially when the cyclists are not wearing helmets at the time of the accidents. The brain can collide with the interior of the skull even if the person is helmeted, however. When the cyclist’s head comes to a sudden stop, the brain will continue to accelerate before it decelerates. This can cause it to jostle back and forth, and the person can suffer a concussion as a result. Skull fractures are also common in bicycle accidents. Sometimes, a person who has a skull fracture will also suffer injury from the fracture to his or her brain because of bone shards penetrating into the brain tissue. People may also suffer brain bleeds. Brain bleeds can cause the brain to swell, and the added pressure inside of the skull can be fatal. Spinal injuries may also happen in bicycle accidents. These can result from the person being thrown from the cycle, landing on his or her head or back at an odd angle. Spinal cord injuries can result in permanent paralysis or death. Fractures throughout the body are also common in bicycle accidents. In many cases, people suffer from multiple fractures when they are involved in bicycle collisions with motor vehicles. Many cyclists suffer fractures to their arms when they fall off their cycles because of stretching them out to help brace themselves as they collide with the ground. Depending on where the cyclist is struck, fractures can also happen in the ribs, lower extremities, back, neck and head. In addition to these other types of injuries, cyclists commonly suffer from facial injuries, including broken jaws, fractured cheekbones, eye injuries, broken noses and other facial injuries. Some of these types of injuries may result in permanent disfigurement even after the person has recovered. If you have been injured in a bicycle accident, you will likely need to get legal representation from a bicycle accident lawyer. It is common for insurance companies to blame the cyclists for accidents that were actually caused by the drivers who collided with them. An attorney may be able to prove that the driver was at fault through solid investigation and skilled negotiation with the insurance company. 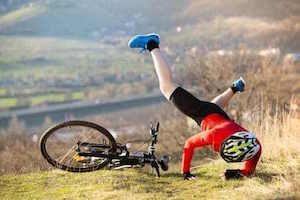 Contact a bicycle accident lawyer today so that you can determine who has legal fault in the accident’s cause as well as your ability to recover compensation for your past and future medical expenses, your lost wages and other economic damages, and your non-economic losses for the pain and suffering the accident has caused you.